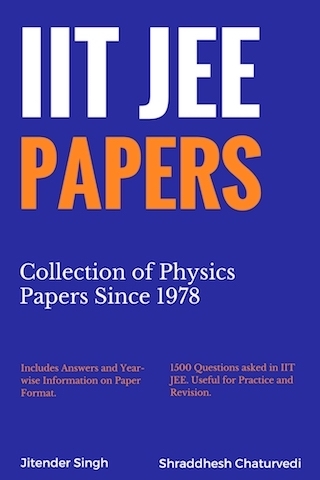 What if you have access to any IIT JEE Physics Paper on the move (phone, laptop, cloud)? No need to search the internet for hours, download pdf's (stuffed with publicity material) and then manage them. This book provide you access to comprehensive, authentic and value added collection of physics papers. Many books gives chapter-wise arrangement of IIT JEE questions. This book present these questions in the original paper-wise format. Contains all physics papers since 1978. It include JEE advanced, JEE screening and also Cancelled papers. Papers/questions collected from multiple sources and then analysed to separate wheat from the chaff. This was part of our IIT JEE Physics Book project. Each paper includes instructions and marking scheme to help you analyse paper format. You can easily navigate from one paper to other through hyperlinks. Each question starts on a fresh page to help you focus on one question at a time. Answers are given at the end of each paper for self evaluation. This book is meant for analysis, practice and revision. Excellent book for students going for competetive examination. Eagerly Waiting for other books from authors. The book is published by PsiPhiETC . Its average rating on Amazon is 5 out of 5 (from 2 reviews as on 27 January 2019). This book is available in Kindle eBook format only.